[New for 2010, discontinued after 2013] Wow, some of my favorites words there: NEW, CHOCOLATE, FUDGE, and BROWNIE (well, and ICE CREAM of course). I went to get some gas at lunch and I knew I needed a treat, but I wasn't expecting anything NEW from a gas station. I think I'm excited about my $2.99 treat! Notice the big " Nestle Toll House " logo, looks like we have chocolate chips in either the ice cream or the brownies, but there's no description so I guess I'll just have to look for myself. chocolate, chocolate, and more chocolate! what more do we really need? the chocolate chips offer up these tiny, sharp crunches throughout my adventure. Hard to say if they are adding taste or not. I'm thinking this was more of a texture decision. oh geez, i've already plowed through half of this container, i should probably stop. Eating the whole pint would bring me 800 calories and all my saturated fat for the day (not that a giant frosty or fast food shake would be any better). It's just not a heavy, filling ice cream. I'm loving the robust, rich nature of the aftertaste. 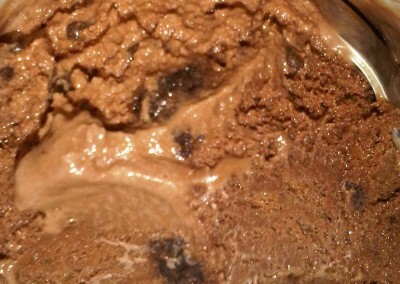 It's really chocolately and makes me wish I had eaten a bit slower. The whole thing comes across as a great flavor combo though I wish the pint had been handled just a bit more carefully (to truly get the full affect of this tasty trio). Are there negatives? Sure, I think there might be a percentage of people who won't like just how chewy the brownie bits are. It's funny because they are only about twice the size of the Breyers brownie bits I reviewed yesterday, but their impact is ten times greater. This is exactly what I was hoping for from Breyers: brownies that leave their mark. Otherwise, why bother? To clarify, today's chocolate is brought to you with a combo of natural and artificial flavors. This isn't some high end cocoa flavor, it's just old fashion, in your face chocolate which has it's place, just like everything else. Need a chocolate fix? Give this one a try. 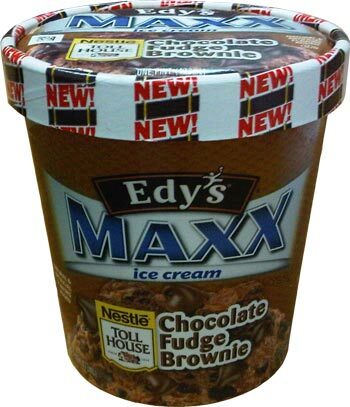 Feel free to check out my Edy's Butterfinger MAXX review as well. On Second Scoop: Edy's has done a good job on this one. The MAXX has had time to totally refreeze and I like it now more than before. The brownie bits are bit less sticky but more importantly they provide a near constant stream of chewy texture throughout the treat. 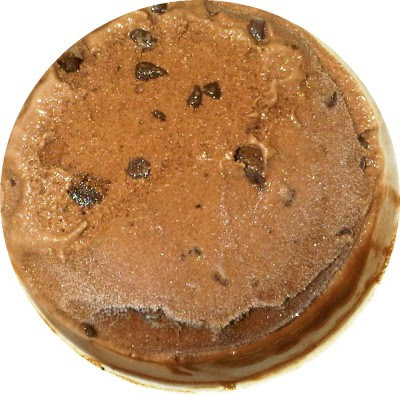 It's kind of funny because the ice cream almost looks like chocolate chocolate chip cookie dough. If you need a chocolate fix, this will certainly suffice!